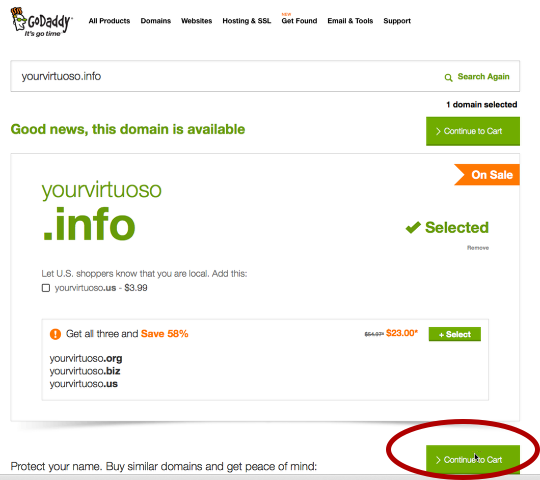 If you would like your own custom, personalized, web address (URL) for your website, you can set that up through one of the many Domain Registrars. 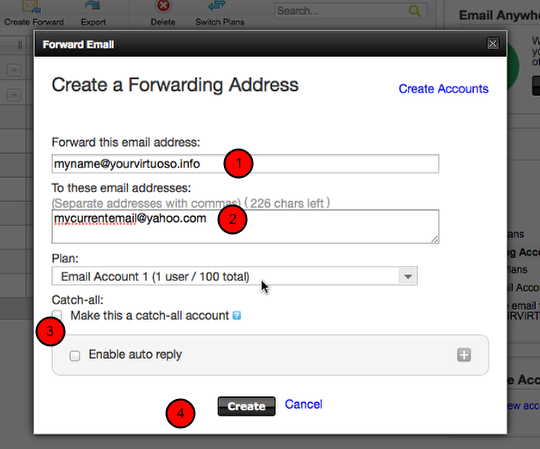 You may need to do this if you currently have a Yahoo or AOL email address, as Yahoo and AOL no longer allow you to use those addresses to send emails from YourVirtuoso or any other mail service provider. By getting a custom domain, you can get one or more custom email addresses to use for your business, and avoid being blocked by AOL or Yahoo. 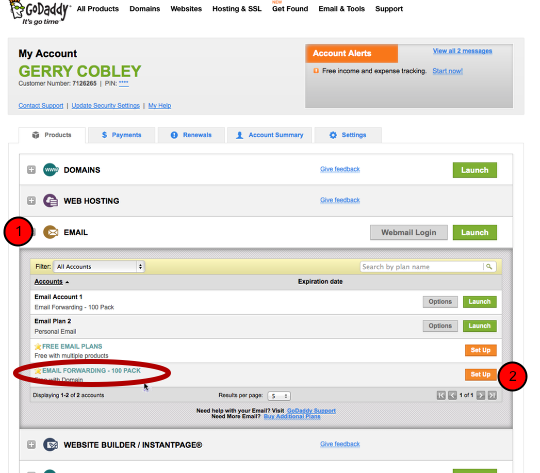 This document uses the Godaddy.com registrar as an example. It is one of the larger and more friendly sites to use. Go to the registrar's website e.g. 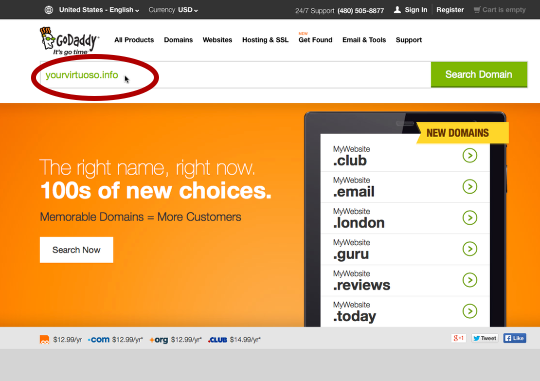 http://godaddy.com and search for a domain you would like for your business. 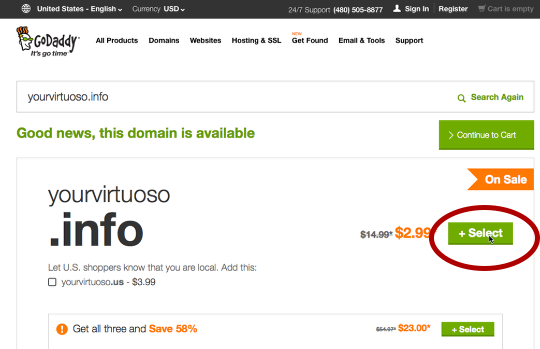 Typically this will be a ".com" domain if you are US based. 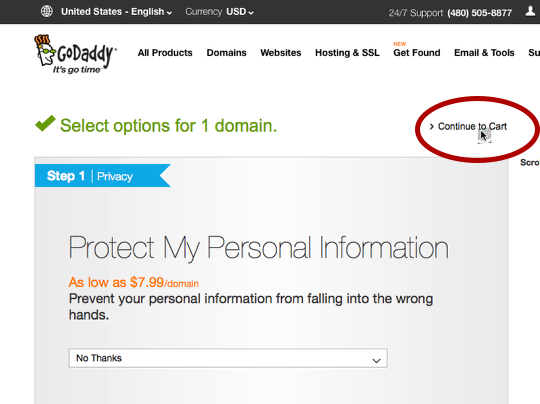 Godaddy will try to sell you other domains and service as you go. Be prepared to stay focussed on the one you actually need! You don't need hosting, and privacy is not really required. We will make the choice of email service later. 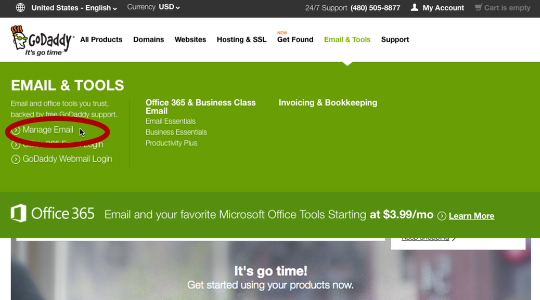 The cheapest option to get an email address for your new domain is to set up email forwarding. 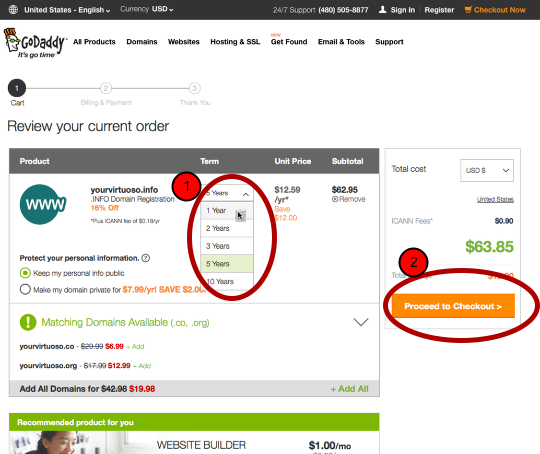 At this time, Godaddy provides free forwarding for new domains, so there is no extra charge. 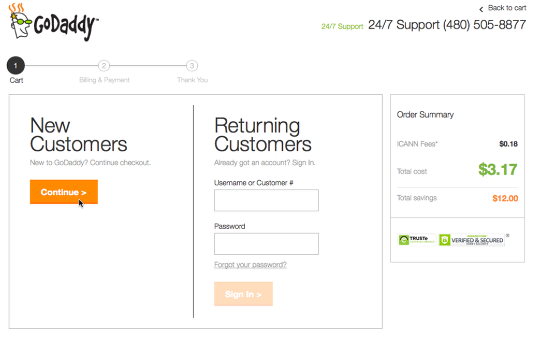 Forwarding means that you will still use your current email system to collect emails and respond to them, but you can publish the new domain email address for your customers (and use it in YourVirtuoso) and any email sent to it will be forwarded to your current email. 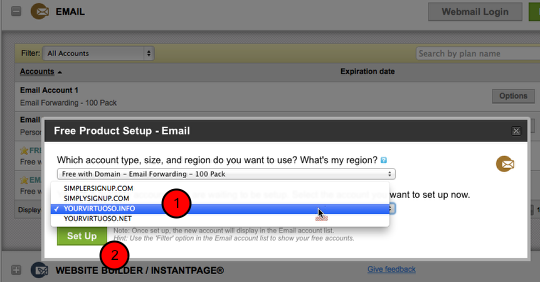 If you want ALL email sent to your domain, even if it is not to your specified address, click to make it a catch all. This has plusses and minuses: On the plus side, if a customer guesses your email incorrectly, but knows the domain, it will get through. On the downside, spammers may do the same and you may see more unwanted email. 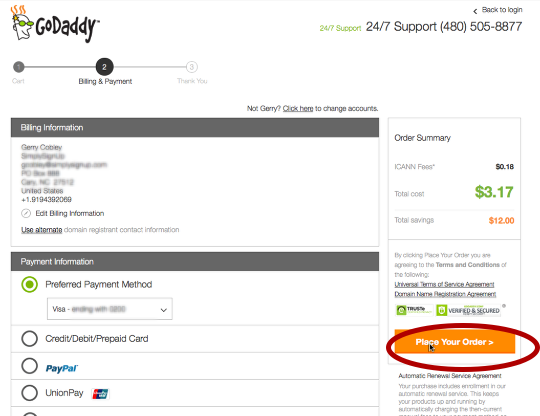 If you would prefer not to use your current email at all, you can purchase a full email account from your domain registrar. 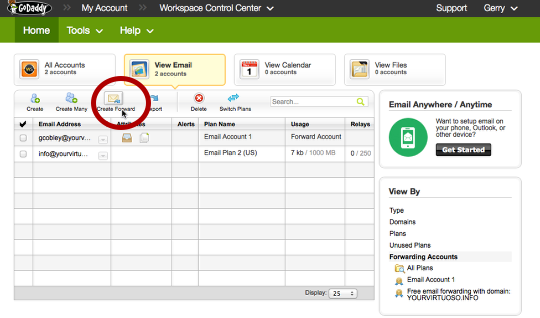 Setting this up is more work, as you have to change your way of reading and sending emails. 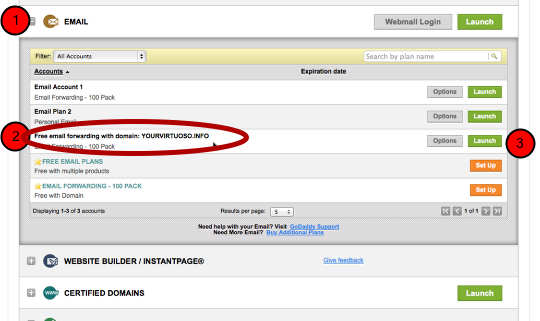 There are several things you should now do for YourVirtuoso, once everything is up and running at the domain registrar. On the MyInfo/Main page (under Setup/MyInfo on older systems) you should click Edit and change the primary licensee email to your new domain one. Under Notifications, you should change all the notifications to use your new email.